Thursday night I went to Terri's super fun Stamp a Stack. I LOVE going to her events, she always has so many fun and beautiful cards to make. This one was made using the Botanical Builder for the flower and the leaf. We used the Scallop Tag Topper punch and stamped the words on it using Cajun Craze ink. The flower was sponged with Cajun Craze ink and then set in place using a Dimensional. The center of the flower is a White Perfect Accents colored in with a black Sharpe marker. The tag was set in place using Dimensionals. 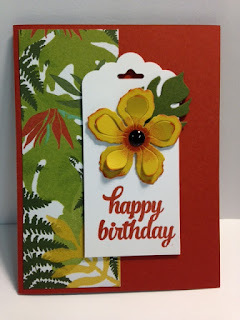 The decorative paper is from the "Botanical Garden" paper pack. I have had a lot of fun making cards with that paper pack. You can change this card so much just by adding a different panel on the left side. The paper pack has a lot of fun images that will work!!! SO much fun!